Your use of the Kinder Law Office website and your communication with Kinder Law Office does not create a lawyer-client relationship with our firm. If you require legal advice, you should retain a lawyer to advise you. If you would like to retain Kinder Law Office, please contact one of our lawyers to determine whether or not our firm can assist you. A lawyer-client relationship between you and our firm will only arise if we specifically agree to act for you in writing. 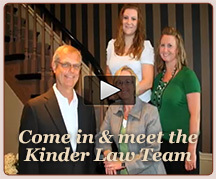 Kinder Law Office does not guarantee the confidentiality of any communication via email or its website. Until we agree to act for you on a matter, you should not provide us with any confidential information or material. Any information sent to Kinder Law Office by email or through this website is not a confidential lawyer-client communication. Any such information will not be treated as confidential and will not be protected by lawyer-client privilege. 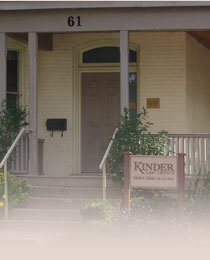 In matters for which Kinder Law Office is retained to represent you, email may not be a secure medium for communication. The information provided on this site is for information purposes only. The material constitutes general information only and does not constitute legal advice and you may not rely on the contents of this website as such. In no event shall Kinder Law Office, its partners, agents, or employees be liable for any loss, cost or damages whatsoever whether direct or indirect arising out of any use or misuse of, or any defects, inaccuracies, errors or omissions in this site.